Many vegan versions of this ultimate comfort food classic exist. We adapted this version from The New Farm Vegetarian Cookbook. Cook and drain the noodles according to the package directions. If using the optional onions and peppers, heat 1 tablespoon of the oil in a large skillet over medium-high heat. Add the chopped onions and peppers and cook until the onions are lightly browned and the peppers are soft, about 5 minutes. Remove from heat and set aside. In a small pot or microwave, bring 1 cup water to boil over high heat. Remove from heat. Melt the vegan buttery spread in a medium pot over medium heat. Stir in the flour. Decrease the heat to low and cook until golden brown and fragrant, about 2 minutes. Stir in the boiling water. Increase the heat to medium and stir until smooth. Add garlic powder, salt, turmeric, soy sauce, and the remaining 2 tablespoons of oil. Fold in the nutritional yeast and stir until smooth. Mix the cooked noodles, vegetables, and sauce, in a 6-cup casserole dish or a 13 x 9 inch baking dishe. Garnish with ground paprika, if desired. Bake for 20 minutes, or until the top begins to brown. For less spice, use bell peppers instead of Anaheim. For more spice, add a pinch of cayenne to the cooked vegetables or add a few tablespoons of hot sauce to the cheese mixture. Try adding different vegetables, such as as broccoli, cauliflower, or mushrooms. Onions are recommended for their sweetness. All vegetables should be cooked before being mixed with the noodles. For a distinctly American twist, fold in chopped veggie dogs before baking. 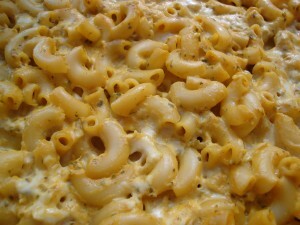 For a more cheesy version, reduce the amount of macaroni or vegetables. For a classic crispy top, spread bread crumbs over the top of the dish before baking. The best soy sauce to use is a dark Chinese soy sauce from an Asian market. The soy sauce available at most American markets is very salty and less flavorful. You can use up to 1 cup of nutritional yeast for a stronger flavor if you like.